Women of Indian subcontinent wear these types of ladies kurta tops. It basically means shirt without collar and the word was originated In Afghanistan by Persian people. Persian men used to wear long kurtas in past. 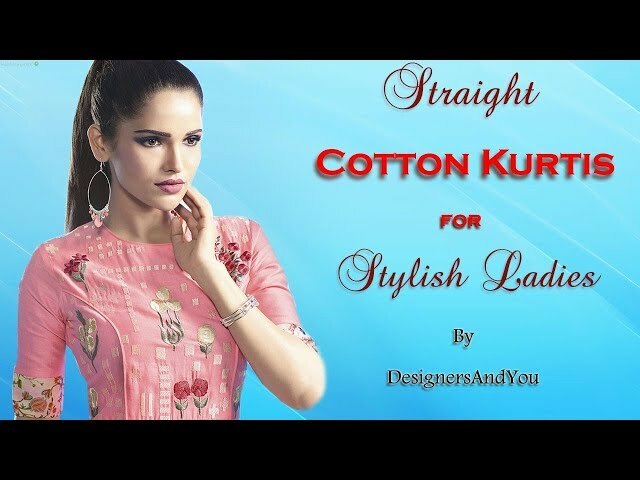 However, it has gone out of the fashion from men’s fashion because of shirts but the same style has become permanent new kurta style for girls. Originally it was evolved In India from the state of culture called Punjab because the trend was started by Punjabi women and is slowly becoming popular in other parts of India. 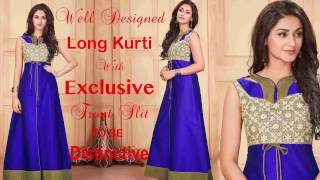 Having a close eye on the basic of the new designs for girls you feel that the Punjabi kurta of contemporary designers has given latest designs an international enchantment to best collection for female. The modernization of short kurta design has blurred the road between ethnic and western wear, and the resulting fashion designer ladies tunics are very famous across the world. The new kurta Patterns for girls offers a formal or a casual look. High collar referred to as (close-neck) bandh gala provide a very professional appearance. Nowadays latest shapes and cuts are in trend. High-low, front cut, Asymeric shape and un-even cuts are primery choice of young ladies. A Lot of styles of mix and match are coming up as a newest fashion in kurta. Combinations like: front side printed and solid colored (either matching contrast or matching) back, both side print patterns with negative possitive style, a small patch od another fabric at border of kurta to add look of layered outfit. Asymmetric Cervix: This design is especially for broad shoulder girls and would not look good on anyone else. Boat neck short kurta designs: This is best to wear for a girl with small bust because it enhances the look of shoulders with boat type shape of the neck. Peter Pan Collar Pattern: When worn this frock style flat neck gives seventies retro look. The dupatta is not preferable because it hides the neck pattern. Printed kurta with Collar neck Patterns: Shirt style top with jeans would look awesome on any girl because of shirt type collar pattern. It is usually available in various prints to match with jeans or pant. Latest Kurta designs for girls with Crew Neck: This style for stitching with t-shirt neck look outrageous on a young girl because of its closed neck pattern. Closed Neck: This neck inspired from men’s kurta style neck and specially designed for Long kurta. Cowl Neckline: The folded fabric like a scarf is the special feature of the girl’s kurta/tops designs. High Collar Neck: This style is the common type in simple black or white kurta and the size of the top is just below the waist line. Halter Neck designs: This kurta style exposes shoulders of girls and only suitable for perfect body shape. High Collar Pakistani Style: This type of collar covers the half neck also referred as Chinese collar. Jewel Neckline Tops With Koti Design: Specially designed to wear in winter and best suited for girls having wide shoulders. Keyhole Neck Style: This type of best Kurta designs for a female is available in many designs but you can recognize it by the big hole or small hole style. Off Shoulder Neck design: The Kurta tops design in a way that it hangs on just below shoulder with the help of elastic fabric.One or Off Shoulder Style: Designer long kurta design having a different pattern of shoulders, one shoulder is just like a normal one and another shoulder starts from underarm. This design was invented from gown style. Pentagon Neckline: This fashionable style is worth to have on designer long kurta designs for ladies. Portrait style Neckline's: This beautiful Kurta designs for a girl is inspired from the English alphabet ‘Y’. Give this style a try and if it goes well with your body shape then go for it. U shape Neck: These designs are exactly shaped as ‘U’ and very much used in today’s fashion. The designs of kurta come in many varieties. V Shape Neck: Go by the name of the design it exactly shapes as V alphabet and looks very trendy in short kurtas. Apart from that, there are many other necklines like: heart shape, queen shape, and many more style. Tip: You must go with suitable patterns according to your body shape and skin tone. Buy women cotton kurtas online and enjoy online shopping from our store at designersandyou.com.